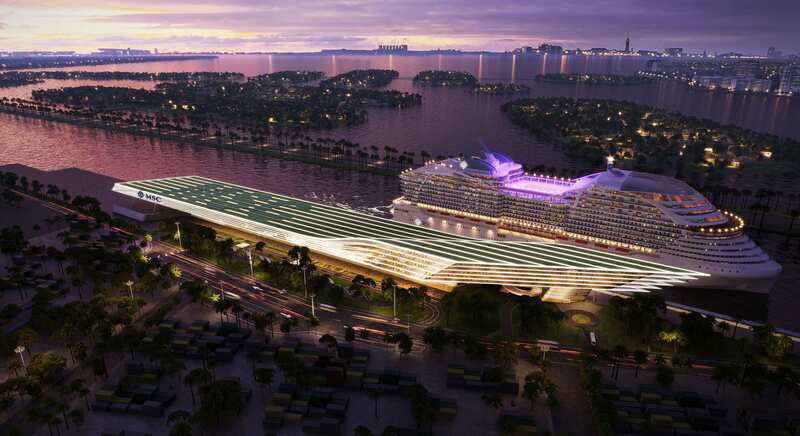 PortMiami, which is already the top cruise port in the world, will be getting its biggest ever cruise terminal from MSC Cruises. Two passenger ships carrying up to 7,000 passengers can be accommodated at a time, for a total of 14,000 departing passengers and 28,000 passenger movements (arriving and departing) in a single day. MSC is planning to base their biggest ships at the new terminal. 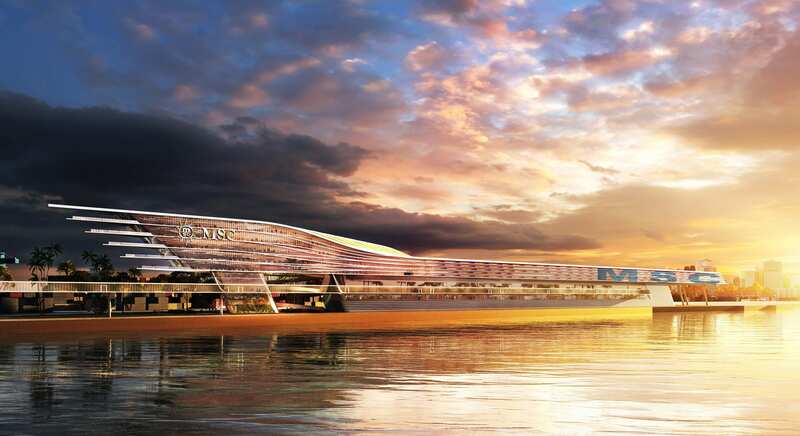 Arquitectonica is designing the roof to be a “monumental sculpture” that will catch the eye of planes flying overhead, condo tower residents and office workers, and passengers on the upper decks of passing ships, Arquitectonica founder Bernardo Fort-Brescia told Seatrade Cruise News. Design is inspired by Italian yachts, with transparent sides and aerodynamic lines (MSC is an Italian company). The architect will also exploit the super long site with a building that spans 1,600 feet in length and a fluid design that keeps people moving in the space, Fort-Brescia said. 2,000 parking spaces will be built within the same building, rather than in a separate garage across the street. 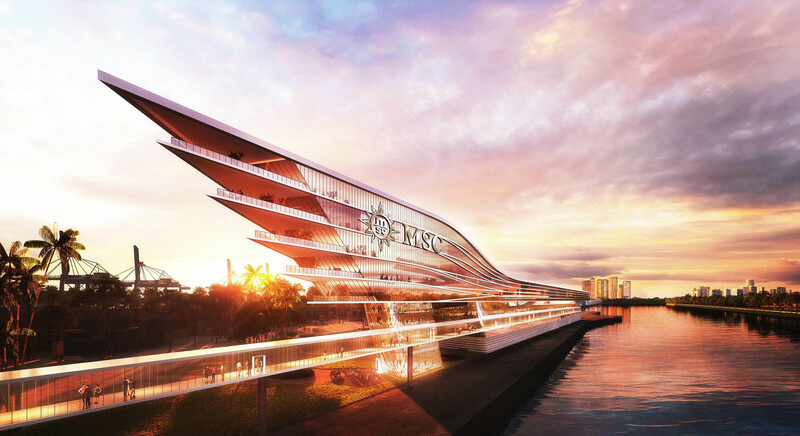 Miami-Dade commissioners have approved the deal, which is expected to generate $1.5 billion over 50 years. In addition to Royal Carribean’s new terminal, Virgin, Norwegian, and Disney have also announced plans for new terminals at the port (Disney hasn’t revealed their design yet). Construction on the MSC Terminal is expected to begin in early 2020, with completion in late 2022. Shore power is a must for all these new terminals. Why hasn’t the Miami-Dade Board of Commissioners requested this as part of the negotiations? For those unaware, shore power is grid power from land rather than running the onboard diesel engines to power the ship while in port. Many other ports in the US – Alaska, Seattle, LA, NY have moved to install and/or require shore power for ships. Having 6-10 mega cruise ships in port all running onboard diesel generators is probably not great for the local air quality. Many are going to LNG. Still emitting pollutants while in port, magnified by 6-10 ships at a time. Shore power is a must and Miami should follow other cities. Some of FPL’s plants are oil fired, which would be more polluting than LNG, although probably less than ship diesel. Too bad Norwegian didn’t put a solar array with battery storage on top of their parking garage. Huh. That’s now how the electric grid works. Power is fungible. Most of FPL’s plants run on natural gas. Island nation states primarily use fuel oil if you want to pick a target for the green dream. Do you know that the cruises aren’t doing this? Just a question. I’ve never seen any article touch on that topic before. If not they really should push for it. This port is growing faster then ever. Page 17 for a map of other US ports. Ctrl-F “Miami” No results found. I Can’t wait until I return to the Miami/fort Lauderdale era in the summer for good. The port skyline is adding to the uniqueness of the Miami skyline. I’m typically aboard the Arquitectonica hate train, but this design looks fantastic–esp. being able to serve ( 2 ) mega ships at once. Many Arquitectonica designs are likely developer limited. MSC probably opened up the pocketbook and some artistic freedom. This is amazing news for port Miami. Even better news for downtown/Brickell hotels. Get ready Miami! Let’s hope the Marriott Marquis Miami Worldcenter Hotel & Expo Center breaks ground soon. Very slick. Isn’t Disney going to build as well? Wonder what that’ll look like. Think two big stinkin mouse ears. Disney can churn out some really good architecture, with a subtle Hidden Mickey of course. Better than Stinkin’ Skyrise any day of the week. Hope it’s not some Mickey Mouse design. Prime dockage may be gone (ie facing the MacArthur) for Disney. Of course they could always dock along Watson Island and turn that terminal into a hotel (what Island Gardens was planning for 20-years). With an elevated Disney-style monorail there connecting the mainland to the Beach. As mentioned by others, there’s no more room for expansion along Govt Cut’s Main Channel on the north side of Dodge Island. Virgin Voyages is already pursuing the NE corner that overlooks the AAA for their Terminal “V”. There was chatter in 2018 about Disney building a Terminal K on the South side of the island, but not much info since. Disney announced upgrades to ( 2 ) Port Canaveral Terminals in January, which makes the most sense for them based on Canaveral’s proximity to Disney World. it’s really nice for Arquetectonica, but don’t get too excited. Zaha’s signature curves look way nicer than this. She’s on another level from anything AQ could dream up. I wonder why none of these companies took advantage of a hotel opportunity at their terminals? Most people who come into town stay before or after their cruise. If I was going to cruise being that I live out of town I would get a room at the terminal I’m shipping from. Doubt ports are zoned for hotel? 4 down 1 to go (Disney) seems like each time renders come out its better than the last proposal. Knowing Disney they may try to out do the competition! I think Branson is also building a terminal. Him and Disney have quite a challenge to better this design. This is on Dodge Island. Yes but isn’t Dodge island right in front of downtown Mr. Google? This terminal is actually very close to Miami Beach. Correct. Closer to MB than to Miami (since Star, Palm, and Hibiscus Islands are part of Miami Beach). You’re in the wrong so there is no need to say mr.google. You compared downtown to brickell so in your logic “isn’t downtown next to brickell. No they’re different just like dodge island is different from downtown. Also please don’t assume my gender. Where does that pedestrian bridge go to? Cant watch the promo video- they left out the other two major(r) cruise line terminals. Stupid silly promo. But good luck M S C ! This looks like it’s going to be situated east of the new Royal Caribbean terminal; wouldn’t both ships docked at that same time be a bit of an impediment to any other cruise chip traveling along government cut?